Worldwide icon-chevron-right North America icon-chevron-right United States icon-chevron-right Pennsylvania icon-chevron-right Philadelphia icon-chevron-right Xfinity Live! From the built-in exclamation point to its supermassive screens and viewing areas, this sports bar/food court, built on the site of the old Spectrum arena, was made for drinking up and bro-ing down. 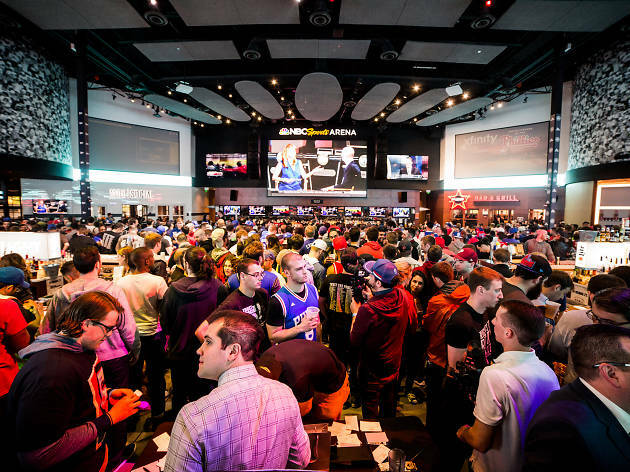 There are several bars within the compound, including the Flyers-themed bar Broad Street Bullies Pub, the country-ish PBR Bar and Grill (featuring a mechanical bull), Victory Beer Hall, NBC Sports Arena and 1100 Social. If you need a respite from yelling “woo!’ and/or “boo!,” wander the outside area where statues of Dr. J, Kate Smith, Joe Frazier and more have been seen shaking their heads in the moonlight.